I must admit that last year's Europa theme, 'Visit...', passed me by without me ever noticing it. 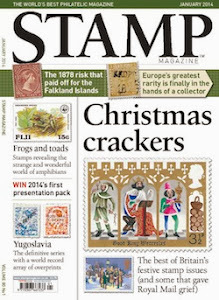 Before writing this, I even had to check and see whether Britain issued any stamps at all on the subject. I'm glad to say they did though, as part of their A to Z series. 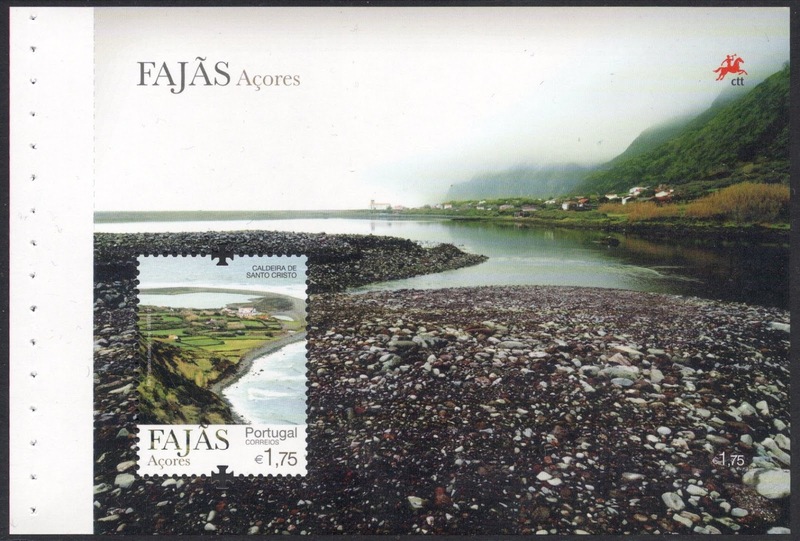 Makes sense, but the fact that I had to go look for it does imply it hasn't really lived up to its theme..
All that changed, however, the moment I received a letter from my Portuguese stamp friend Paulo who had spent his holidays on the Azores. 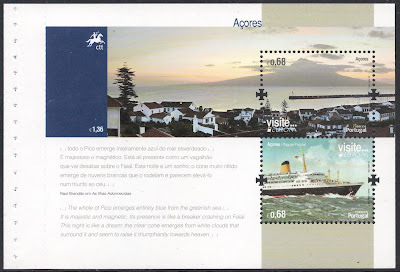 It not only contained a rather nice picture postcard and had the latest Azores stamps on cover, but it also included a prestige booklet with the 2012 Europa stamps in. And I was hooked immediately! The theme of the booklet and stamps was the so-called Fajas of the Azores, which you'll find on the island of Sao Jorge. 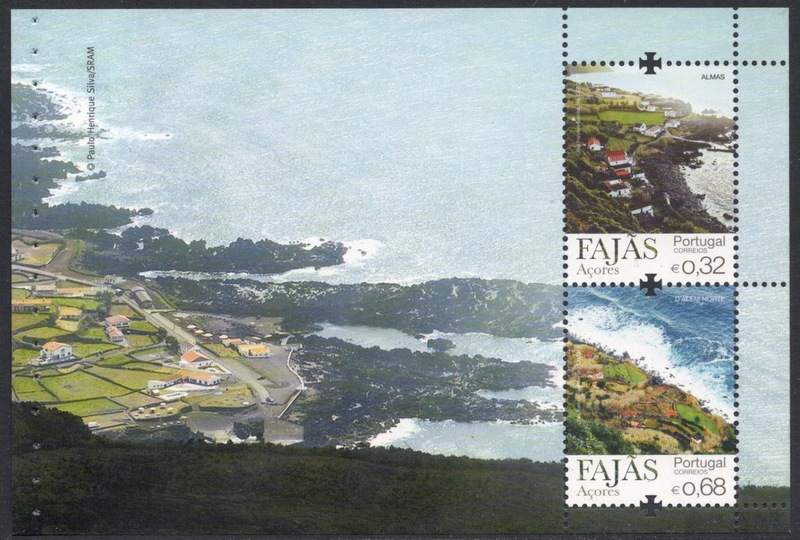 That is a volcanic island rising out of the sea with incredibly steep cliffs. The many eruptions and landslides have created very small flat lands in between the coast and the sea, and these are called the Fajas. They were cultivated by the inhabitants though many have since been deserted as well. As you can see from the pages of the booklet, they are incredibly atmospheric places. 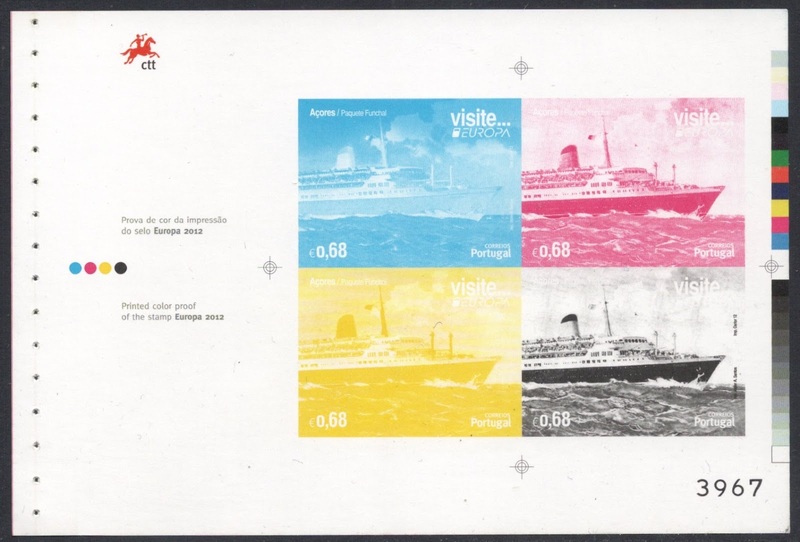 The official Europa stamp depicts the ferry that will get you there and unfortunately this is the only boring stamp of the package, though I'm sure ship collectors would heartily disagree with me! Fortunately for me, though, the Azores postal authorites have made up for that by including a page which shows the stamp broken up in its four printing colours. It still amazes me, the idea that these four colours together are able to create a multicolour image. If I didn't know better I'd call it magic! 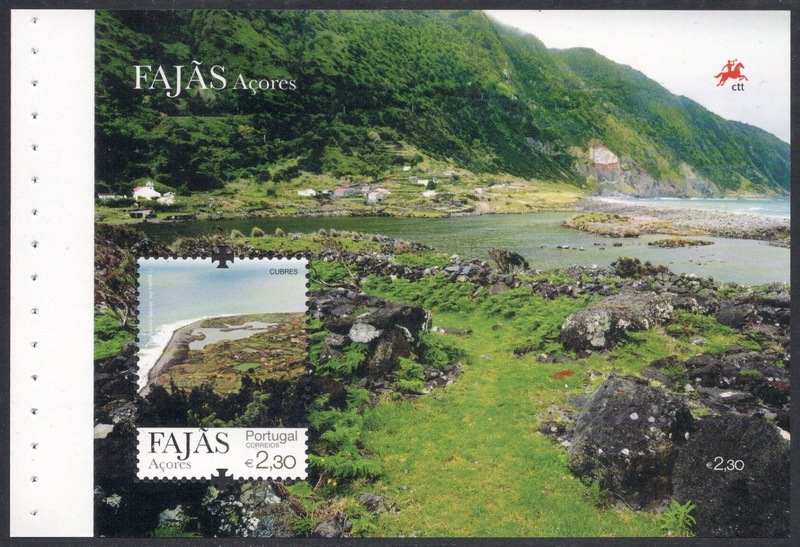 I know the 'Best Europa Stamp' competition for 2012 has long closed and I seem to remember the Azores not winning but for me they absolutely are the best of the crop! If a simple booklet such as this can make me look up all the information on its subject and even make me long to go there and see this beautiful land with my own eyes, then it's clear that the designers have managed to convey the concept of 'Come and visit...' down to a t! Well the least I can do is to make a comment on this article. Glad you liked it and all of you who can vist this Island of São Jorge (St. George) will be amazed by it's beauty. Just google it in pictures and be amazed. This island it's called like this because of it's shape, like the sword of St. George.